Will it not be nice to know how to mix colors well before spending all that money on tons of different colors? Thanks to modern technology, today's artists are blessed with many wonderful colors unknown to the artists of earlier times. As I am writing this page, there are probably new colors being developed and introduced into the market! I began to mix colors back when first I picked up oil painting. I copied my art instructors' palettes of colors without thinking much about it or knowing much about the colors being used. I thought at the time that a palette of ten to twelve colors plus white was a “limited” palette. Then one year I took a workshop from a famed oil painter and learned a whole new approach to building a palette. Suddenly, I felt I had control of the colors instead of the other way around! Using a truly limited palette, I was able to mix colors I wanted and harmonize them faster than when struggling with a palette of seven or eight colors straight out from the tubes. I have had students who started out with more than a dozen colors on their palettes—talk about potential for confusion and disaster! I was not convinced that the simple approach actually works until I saw the commissioned portraits that the instructor had created using this system. When I did, I was astounded that she would share her secret with us. You might be surprised that an experienced painter would go to a workshop to learn how to create a color wheel like any beginning student, but that was what I did, and I learned a lot. Here is what I learned: you start with three primary colors—one from each color group (red, blue, and yellow)—plus white. If you do not know what colors to begin with, I recommend starting with alizarin crimson (a violet red), ultramarine blue, lemon yellow, and titanium white. You can, however, replace any of them with your own preferred colors. When you lay out the three colors on your palette, take care that there are spaces between them for placing secondary colors. Mix colors like blue and yellow to make green, red and yellow to make orange, and lastly, blue and red to make purple. The ratio of the paints in each mixture will determine the hue. If more red is added, your purple will appear more red violet. If more blue is added, your purple will be bluish purple. I find the process to be exciting because there is a magic in watching the colors form. Once you have these first six colors on your palette, I recommend you add a few piles of grays to tone down the colors. To make the grays, mix all the primary colors on your palette and add white to it. While you are at it, mix both dark and mid-tone grays by using white. You will find that these grays come in handy for harmonizing the colors in your paintings, because they contain all the pigments which are being used to create every other color you are using. When mixing a new color, work to identify the three attributes of the colors and then mix it. Ask yourself, “What is the hue?” “How intense is it?” and “How dark or light is it?". Learn how to see colors. Make colors lighter by adding white, mute it and darken it using the dark gray you just made. Another useful way to mute a color is to mix its complementary color with it. To make a yellow less intense, add a small amount of purple. But not too much—if you add an almost equal amount of purple to yellow, you will end up having a brown, although it is a beautiful brown. When you finish your painting, save the leftover colors, mix them together, and make a few fresh piles of grays for next time! With practice, you will learn to gauge the ratio of colors to mix and be able to accurately create the colors you want. You will soon find that harmonizing colors in your painting is easy. And by cutting down on mistakes, you'll save money on paint as well! Once you are comfortable with using the three primary colors, you may want to add one or two colors at a time to your palette and experiment with new color mixtures. Yes, you can. After you learn how to mix colors with only three primary colors, try the subtle triad scheme (three colors equal distances apart on the color wheel). 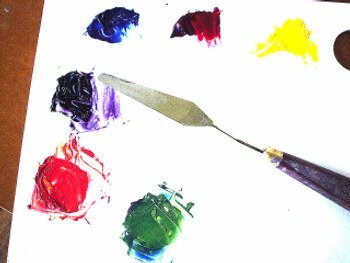 One such set I like is burnt sienna, yellow ochre, and ultramarine blue. 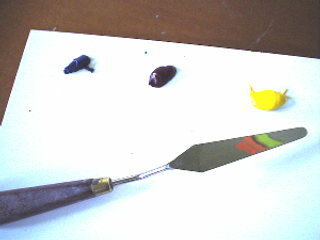 Another set is cadmium orange, viridian, and manganese violet. One time I used black, cadmium red light, yellow ochre, and titanium white for a painting. In this case I used black as a replacement for blue. So be creative and be willing to try different colors. There is no magic formula for choosing colors for your palette. You can create remarkable paintings using ordinary colors, but blindly copying from some famed artist's multi-color palette will only confuse you if you do not know the basics of mixing colors. So, start simple with three colors and gradually you will master the art of mixing colors!